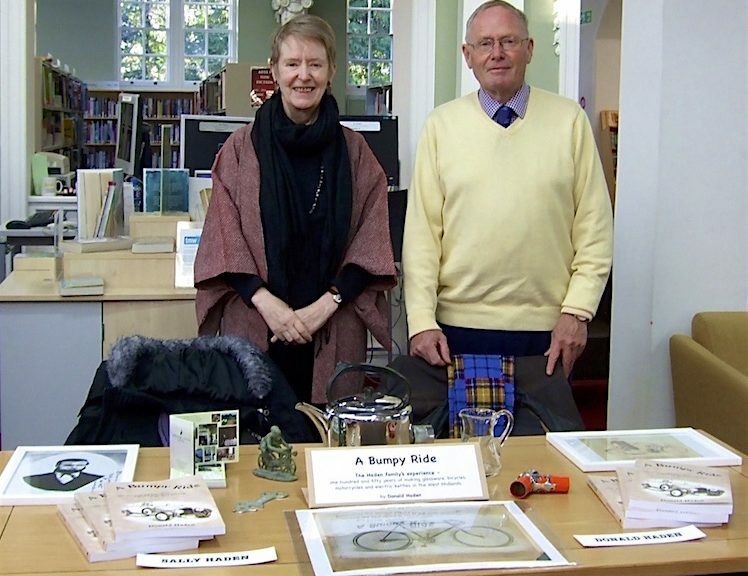 At Malvern Library in November last year we were thrilled to launch Donald’s book A Bumpy Ride: One Hundred and Fifty Years of Haden Manufacturing in the West Midlands. Every author enjoys launching his or her work, but for us the day was enormously satisfying because A Bumpy Ride represented no less than ten years’ work, and neither of us had previously published a book. A Bumpy Ride, written by Donald, illustrated by Sally and put together with the help of publishers Aspect Design of Malvern, tells the story of the Haden family and its involvement with West Midlands manufacturing, as well as the hotel industry in Ireland. Three Victorian ancestors worked in the glass industry, one of them moving into bicycle making in Birmingham. George Haden was a pioneer bicycle manufacturer and the founder of the business which was to sustain the family through four generations. George’s son Alfred manufactured motorcycles in the early Twentieth century under the marque “New Comet”, and his twin grandsons Donald and Dennis developed the company as a manufacturer of bicycle and motor vehicle components. About mid-century Dennis branched out into small domestic appliance manufacturing, forming Haden Kettles, while Donald, with his son Donald (the author), worked hard to adapt Haden Bros. Ltd. to the changing market of the later Twentieth century. They made a variety of components for many different industries at home and abroad. Peter Haden, the author’s twin brother, entered the hotel industry and established a successful hotel on the West coast of Ireland, now in the hands of his eldest son, Simon. A Bumpy Ride is an entertaining story, full of humour, as well as insight into what it takes to sustain a family business through several generations. Also it offers a unique perspective on Birmingham, its growth and change as an industrial city, speaking from the personal viewpoint of those who made it their home for over one hundred and fifty years. A Bumpy Ride: One Hundred and Fifty Years of Haden Manufacturing in the West Midlands is available postage-free (within the UK) direct from Donald. Please complete the Contact Us page on this site, then Donald will send you payment details and post it to you straight away. Or you can order it from Amazon.